Obsessive-compulsive and related disorders are a group of overlapping disorders that generally involve intrusive, unpleasant thoughts and repetitive behaviors. Many of us experience unwanted thoughts from time to time (e.g., craving double cheeseburgers when dieting), and many of us engage in repetitive behaviors on occasion (e.g., pacing when nervous). However, obsessive-compulsive and related disorders elevate the unwanted thoughts and repetitive behaviors to a status so intense that these cognitions and activities disrupt daily life. Included in this category are obsessive-compulsive disorder (OCD), body dysmorphic disorder, and hoarding disorder. People with obsessive-compulsive disorder (OCD) experience thoughts and urges that are intrusive and unwanted (obsessions) and/or the need to engage in repetitive behaviors or mental acts (compulsions). A person with this disorder might, for example, spend hours each day washing his hands or constantly checking and rechecking to make sure that a stove, faucet, or light has been turned off. Obsessions are more than just unwanted thoughts that seem to randomly jump into our head from time to time, such as recalling an insensitive remark a coworker made recently, and they are more significant than day-to-day worries we might have, such as justifiable concerns about being laid off from a job. Rather, obsessions are characterized as persistent, unintentional, and unwanted thoughts and urges that are highly intrusive, unpleasant, and distressing (APA, 2013). Common obsessions include concerns about germs and contamination, doubts (“Did I turn the water off?”), order and symmetry (“I need all the spoons in the tray to be arranged a certain way”), and urges that are aggressive or lustful. Usually, the person knows that such thoughts and urges are irrational and thus tries to suppress or ignore them, but has an extremely difficult time doing so. These obsessive symptoms sometimes overlap, such that someone might have both contamination and aggressive obsessions (Abramowitz & Siqueland, 2013). Compulsions are repetitive and ritualistic acts that are typically carried out primarily as a means to minimize the distress that obsessions trigger or to reduce the likelihood of a feared event (APA, 2013). Compulsions often include such behaviors as repeated and extensive hand washing, cleaning, checking (e.g., that a door is locked), and ordering (e.g., lining up all the pencils in a particular way), and they also include such mental acts as counting, praying, or reciting something to oneself ([link]). Compulsions characteristic of OCD are not performed out of pleasure, nor are they connected in a realistic way to the source of the distress or feared event. Approximately 2.3% of the U.S. population will experience OCD in their lifetime (Ruscio, Stein, Chiu, & Kessler, 2010) and, if left untreated, OCD tends to be a chronic condition creating lifelong interpersonal and psychological problems (Norberg, Calamari, Cohen, & Riemann, 2008). An individual with body dysmorphic disorder is preoccupied with a perceived flaw in her physical appearance that is either nonexistent or barely noticeable to other people (APA, 2013). These perceived physical defects cause the person to think she is unattractive, ugly, hideous, or deformed. These preoccupations can focus on any bodily area, but they typically involve the skin, face, or hair. The preoccupation with imagined physical flaws drives the person to engage in repetitive and ritualistic behavioral and mental acts, such as constantly looking in the mirror, trying to hide the offending body part, comparisons with others, and, in some extreme cases, cosmetic surgery (Phillips, 2005). An estimated 2.4% of the adults in the United States meet the criteria for body dysmorphic disorder, with slightly higher rates in women than in men (APA, 2013). Although hoarding was traditionally considered to be a symptom of OCD, considerable evidence suggests that hoarding represents an entirely different disorder (Mataix-Cols et al., 2010). People with hoarding disorder cannot bear to part with personal possessions, regardless of how valueless or useless these possessions are. As a result, these individuals accumulate excessive amounts of usually worthless items that clutter their living areas ([link]). Often, the quantity of cluttered items is so excessive that the person is unable use his kitchen, or sleep in his bed. People who suffer from this disorder have great difficulty parting with items because they believe the items might be of some later use, or because they form a sentimental attachment to the items (APA, 2013). Importantly, a diagnosis of hoarding disorder is made only if the hoarding is not caused by another medical condition and if the hoarding is not a symptom of another disorder (e.g., schizophrenia) (APA, 2013). The results of family and twin studies suggest that OCD has a moderate genetic component. The disorder is five times more frequent in the first-degree relatives of people with OCD than in people without the disorder (Nestadt et al., 2000). Additionally, the concordance rate of OCD among identical twins is around 57%; however, the concordance rate for fraternal twins is 22% (Bolton, Rijsdijk, O’Connor, Perrin, & Eley, 2007). Studies have implicated about two dozen potential genes that may be involved in OCD; these genes regulate the function of three neurotransmitters: serotonin, dopamine, and glutamate (Pauls, 2010). Many of these studies included small sample sizes and have yet to be replicated. Thus, additional research needs to be done in this area. A brain region that is believed to play a critical role in OCD is the orbitofrontal cortex (Kopell & Greenberg, 2008), an area of the frontal lobe involved in learning and decision-making (Rushworth, Noonan, Boorman, Walton, & Behrens, 2011) ([link]). In people with OCD, the orbitofrontal cortex becomes especially hyperactive when they are provoked with tasks in which, for example, they are asked to look at a photo of a toilet or of pictures hanging crookedly on a wall (Simon, Kaufmann, Müsch, Kischkel, & Kathmann, 2010). 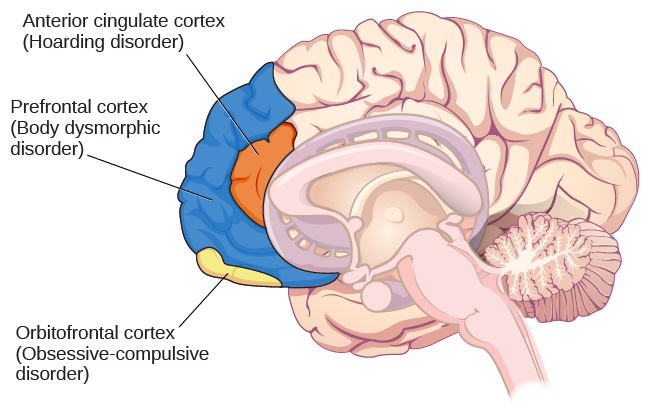 The orbitofrontal cortex is part of a series of brain regions that, collectively, is called the OCD circuit; this circuit consists of several interconnected regions that influence the perceived emotional value of stimuli and the selection of both behavioral and cognitive responses (Graybiel & Rauch, 2000). As with the orbitofrontal cortex, other regions of the OCD circuit show heightened activity during symptom provocation (Rotge et al., 2008), which suggests that abnormalities in these regions may produce the symptoms of OCD (Saxena, Bota, & Brody, 2001). Consistent with this explanation, people with OCD show a substantially higher degree of connectivity of the orbitofrontal cortex and other regions of the OCD circuit than do those without OCD (Beucke et al., 2013). Different regions of the brain may be associated with different psychological disorders. The findings discussed above were based on imaging studies, and they highlight the potential importance of brain dysfunction in OCD. However, one important limitation of these findings is the inability to explain differences in obsessions and compulsions. Another limitation is that the correlational relationship between neurological abnormalities and OCD symptoms cannot imply causation (Abramowitz & Siqueland, 2013). The symptoms of OCD have been theorized to be learned responses, acquired and sustained as the result of a combination of two forms of learning: classical conditioning and operant conditioning (Mowrer, 1960; Steinmetz, Tracy, & Green, 2001). Specifically, the acquisition of OCD may occur first as the result of classical conditioning, whereby a neutral stimulus becomes associated with an unconditioned stimulus that provokes anxiety or distress. When an individual has acquired this association, subsequent encounters with the neutral stimulus trigger anxiety, including obsessive thoughts; the anxiety and obsessive thoughts (which are now a conditioned response) may persist until she identifies some strategy to relieve it. Relief may take the form of a ritualistic behavior or mental activity that, when enacted repeatedly, reduces the anxiety. Such efforts to relieve anxiety constitute an example of negative reinforcement (a form of operant conditioning). Recall from the chapter on learning that negative reinforcement involves the strengthening of behavior through its ability to remove something unpleasant or aversive. Hence, compulsive acts observed in OCD may be sustained because they are negatively reinforcing, in the sense that they reduce anxiety triggered by a conditioned stimulus. Suppose an individual with OCD experiences obsessive thoughts about germs, contamination, and disease whenever she encounters a doorknob. What might have constituted a viable unconditioned stimulus? Also, what would constitute the conditioned stimulus, unconditioned response, and conditioned response? What kinds of compulsive behaviors might we expect, and how do they reinforce themselves? What is decreased? Additionally, and from the standpoint of learning theory, how might the symptoms of OCD be treated successfully? Obsessive-compulsive and related disorders are a group of DSM-5 disorders that overlap somewhat in that they each involve intrusive thoughts and/or repetitive behaviors. Perhaps the most recognized of these disorders is obsessive-compulsive disorder, in which a person is obsessed with unwanted, unpleasant thoughts and/or compulsively engages in repetitive behaviors or mental acts, perhaps as a way of coping with the obsessions. Body dysmorphic disorder is characterized by the individual becoming excessively preoccupied with one or more perceived flaws in his physical appearance that are either nonexistent or unnoticeable to others. Preoccupation with the perceived physical defects causes the person to experience significant anxiety regarding how he appears to others. 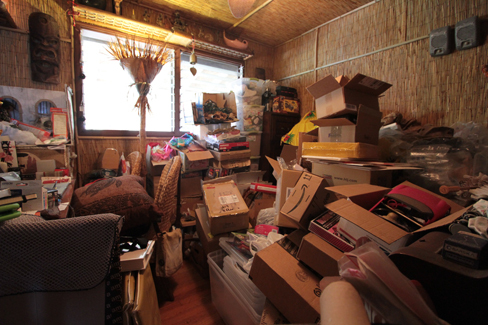 Hoarding disorder is characterized by persistent difficulty in discarding or parting with objects, regardless of their actual value, often resulting in the accumulation of items that clutter and congest her living area. Which of the following best illustrates a compulsion? Research indicates that the symptoms of OCD ________. Discuss the common elements of each of the three disorders covered in this section: obsessive-compulsive disorder, body dysmorphic disorder, and hoarding disorder. Each of the three disorders is characterized by repetitive thoughts and urges, as well as an uncontrollable need to engage in repetitive behavior and mental acts. For example, repetitive thoughts include concerns over contamination (OCD), imaged physical defects (body dysmorphic disorder), and over discarding one’s possessions (hoarding disorder). An uncontrollable need to engage in repetitive behaviors and mental acts include persistent hand-washing (OCD), constantly looking in the mirror (body dysmorphic disorder), and engaging in efforts to acquire new possessions (hoarding disorder). Obsessive-Compulsive and Related Disorders by OpenStaxCollege is licensed under a Creative Commons Attribution 4.0 International License, except where otherwise noted.